to make it easier to move through a series of images -- it’s now faster, more reliable and lets the images do the talking. 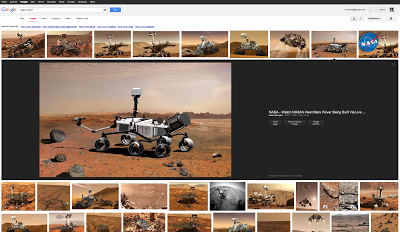 Instead of sending you over to a whole new page to preview an image, you’ll see a preview of the image in your search results. Once you click on an image, you can quickly flip through the whole set of image previews using your keyboard. Your search results stay in the panel so you don’t lose track of what you were doing; if you want to go back to looking at other search results, you can just scroll down and pick up right where you left off. If you want to check out the website where the image is hosted, you can click on the photo or use the tools available.